GLOBAL Internet Terminal franchise business opportunity. Free GLOBAL Internet Terminal business franchise information. We are rapidly becoming a mobile society. By 2004 210 million people in the <?xml:namespace prefix = st1 ns = "urn:schemas-microsoft-com:office:smarttags" />US are expected to be online. Internet terminals are about to become as commonplace as candy machines, ATMs and payphones. In fact, they are looking to replace them. The boom of pay phones in the 80's and ATM machines in the 90's earned entrepreneurs millions of dollars. Now, the new and exciting market of Internet terminals is poised to explode and earn money for motivated people who see its future and are ready to act. The wrong question to ask is, "where will I find an Internet terminal?" The RIGHT question to ask is, "where won't I?" The time to get involved in this market is now! 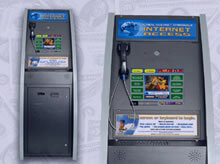 With your public access Internet terminals you can move your terminal from location to location. You can run your business from home. You need no employees. Minimal time is required to clean the machine, keep it running and collect your money. Each terminal provides point-of-sale advertising. Each location has employees who can act as security to protect the terminal. Terminals can make you money 24 hours a day, 7 days a week, 365 days a year for many years. To learn more about the GLOBAL Internet Terminals business opportunity, simply complete the form below.